A month before the start of the world climate summit, Munich Re is drawing attention to the strong probability that there is a connection between the large number of weather extremes and climate change. The reinsurer has built up the world’s most comprehensive natural catastrophe database, which shows a marked increase in the number of weather-related events. 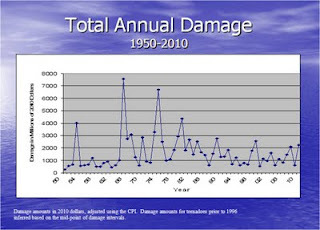 For instance, globally, loss-related floods have more than tripled since 1980, and windstorm natural catastrophes more than doubled, with particularly heavy losses from Atlantic hurricanes. This rise cannot be explained without global warming. [I]t would seem that the only plausible explanation for the rise in weather-related catastrophes is climate change. A new paper is forthcoming in the journal Climatic Change in 2012 helps to shed some additional light on such claims. The new paper -- titled "A Trend Analysis of Normalized Insured Damage from Natural Disasters" by Fabian Barthel and Eric Neumayer of the London School of Economics -- is a follow on to their earlier work which was published last November (and if you read that one, the new study won't be surprising). [At a global scale] no significant trend is discernible. Similarly, we do not find a significant trend if we constrain our analysis to non-geophysical disasters in developed countries . . .
Convective events, i.e. flash floods, hail storms, tempest storms, tornados, and lightning, deserve closer attention since these are likely to be particularly affected by future global warming (Trapp et al. 2007, 2009; Botzen et al. 2009) and there is some evidence that past climatic changes already affected severe thunderstorm activity in some regions (Dessens 1995; Kunz et al. 2009). Figure 7a shows that there is no significant trend in global insured losses for these peril types. Similarly, there is no significant trend in insured losses for storm events (Figure 7b), tropical cyclones (Figure 7c) or precipitation-related events (Figure 7d). They do find a positive trend in insured losses in the US since 1973, and for specific phenomena such as hurricanes and floods, for which longer-term data sets show no upwards trends for either phenomena (and which Barthel and Neumayer acknowledge). Interestingly, they also claim to find a positive trend in insured losses from convective events in the US (including tornadoes), which is in sharp disagreement with our recent work on normalized tornado losses, which finds a dramatic reduction in both economic losses and strong tornadoes since 1950 (in fact, even the non-normalized economic losses show a downward trend). They also find upward trends in storm losses in the western part of Germany. The acknowledge that both regional trends might be associated with simple variability or how they adjust for insurance penetration -- it will be interesting to reconcile our tornado work with theirs (ours focuses on total damage). Climate change neither is nor should be the main concern for the insurance industry. The accumulation of wealth in disaster-prone areas is and will always remain by far the most important driver of future economic disaster damage. . .
What the results tell us is that, based on the very limited time-series data we have for most countries, there is no evidence so far for a statistically significant upward trend in normalized insured loss from extreme events outside the US and West Germany. 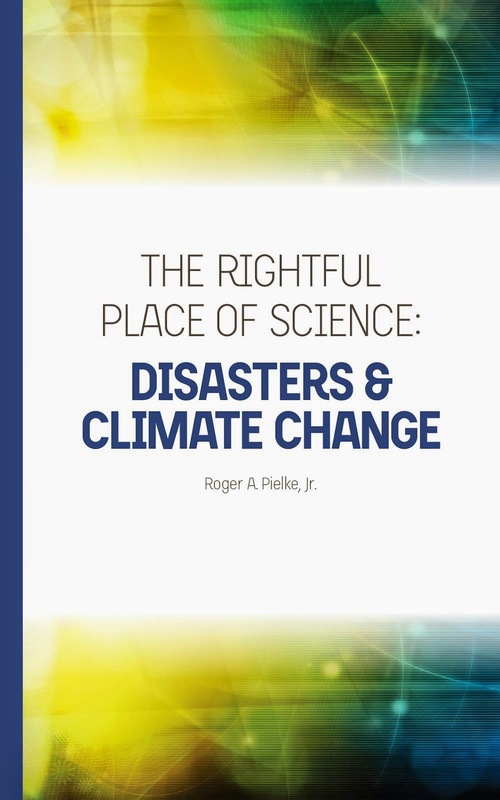 . .
[W]e warn against taking the findings for the US and Germany as conclusive evidence that climate change has already caused more frequent and/or more intensive natural disasters affecting this country. To start with, one needs to be careful in attributing such a trend to anthropogenic climate change, i.e. climate change caused by man-made greenhouse gas emissions. Our findings reported in this article could be down to natural climate variability that has nothing to do with anthropogenic climate change. Such natural climate variability may well explain our finding of a significant upward trend in insured loss from hurricanes in the US, for example. . . They offer several other methodological cautions about the interpretation of the few trends that they found, and quite appropriately. The authors acknowledge support from the Munich Re Programme “Evaluating the Economics of Climate Risks & Opportunities in the Insurance Sector” at LSE. My favorite press spokesman at LSE, Bob Ward, also gets an acknowledgment. So the next time that Munich Re wants to attribute the growing toll of disaster losses to climate change, or you see someone citing Munich Re saying as much, they might be reminded of the Munich Re funded (and peer-reviewed) research which tells quite a different story than that found in press releases.